This is the story of Justin who lands the role of hosting a TV show named Star Juice, later named Astronomy Gossip. 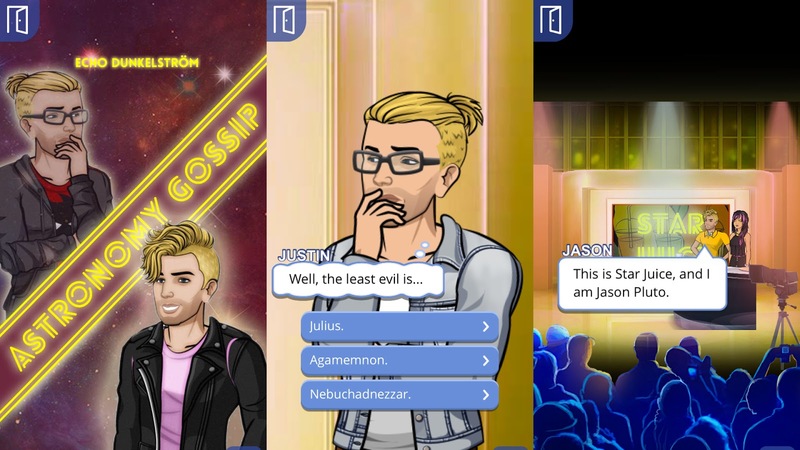 For the show, he becomes a heightened version of himself: Jason Pluto, and has to balance his daily life as Justin with his showbusiness life as Jason. First of all, I love the fact that this story has a male MC! It's rare to find this on Episode, so this immediately appealed to me. And Justin/Jason is such a lovely, relatable guy who's just trying to get by in the world - I was rooting for him from the very beginning. There were lots of other things that really stood out to me when reading this story. I loved how Justin spent his free time finishing other writers' abandoned stories (I found it quite moving!) and on top of being perfectly directed, I thought it handled some very interesting themes such as loneliness and asexuality really well. If you're getting tired of stories that follow the same cliches on Episode, I would ABSOLUTELY recommend Astronomy Gossip! It's so unique and interesting, and has such a fully fleshed out and believable cast that you'll half-believe they really do exist! If you would like your story to be featured next week, simply follow me on Instagram @josephcevans, repost one of my Feature Friday posts to your Instagram page using the hashtag #episodelifefeature, then post a link to your story on this post here on Episode Life! I'll be looking through entries each week to find my next favourite story!